hardware is perfect for multifamily and industrial submetering applications. The Byram Data Collector can be installed at any location that has a power outlet on a property. The Data Collector communicates directly with the meters and the transmitters and sends all of the utility information back to Byram's servers. We then host this data on your unique cloud based portal that enables you to see your exact utility usage. The Gatekeeper can be installed directly into a meter socket and will work as both an electric meter and a collection unit. The gatekeeper communicates directly with the other meters and the transmitters and sends all of the utility information back to Byram's servers. We then host this data on your unique cloud based portal that enables you to see your exact utility usage. 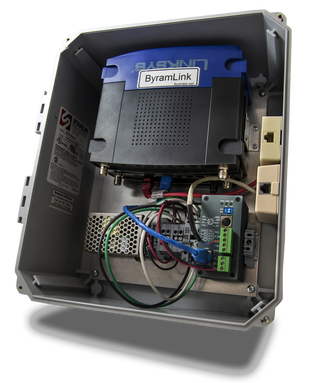 ​The new ByramLink AMI Router from Byram Labs incorporates innovative software with robust industry recognized hardware to bring a unique solution to the meter data back haul arena. The ByramLink expands on the idea of a typical IP serial server by automatically managing and maintaining its own VPN link to the host AMI server. The major benefit of this approach is to circumvent the challenges encountered with dynamic IP assignment. It is often times costly or impractical to configure a network to assign static IP addresses for AMI devices. ByramLink solves this by reaching out to the head-end to establish a persistent tunnel which carries AMI traffic over a secure link. Should the IP assignment on the local network change, the Byram-Link will adapt on-the-fly to ensure connectivity to all attached AMI devices. Byram’s repeaters are designed to meet residential metering requirements and provide remote communications. As a component of the EnergyAxis® System, our repeaters bring advanced metering infrastructure capabilities to residential metering applications. Proven 2-way communications using EnergyAxis® 900 MHz FHSS RF technology, providing the ideal combination of speed, penetration, and RF power. Future upgradability with over the air firmware upgrades. Advanced energy theft and meter tampering detection technology. Advanced security with full 128-bit AES encryption. Byram’s outdoor repeaters are designed to meet residential metering requirements and provide remote communications in a compact outdoor enclosure. As a component of the EnergyAxis® System, our repeaters bring advanced metering infrastructure capabilities to residential metering applications. Available for new construction and retrofit applications, The Pulse Transmitter from Byram Laboratories, Inc. is a compact, low cost, programmable transmitter designed to accept relatively fast, un-scaled, raw pulses from devices such as: Flow sensors, BTU meters, electric, gas, water meters, portable kWh meters, instrumentation and process applications. This transmitter can be installed on many different manufacturers products and comes standard with a twenty year battery life.